Hotel Malhotra Bridge view is situated in the beautiful city Shimla, capital of Himachal Pradesh. The hotel is a unique brand of leisure and pleasure. Hotel Malhotra Bridge View is located right next to the lift on mall road. Hotel is about 1.2 Km from main bus stand and 1.5 Km from railway station. The hotel is located in the centre of mall road that offers tourists a panoramic view of lush green valleys and majestic mountains. Hotel is easily accessible to all places of interest. Hotel Malhotra Bridge View has well equipped air conditioned rooms with all modern amenities and deluxe facilities. All the rooms of hotel are cozy with all facilities that provide you a comfortable stay. 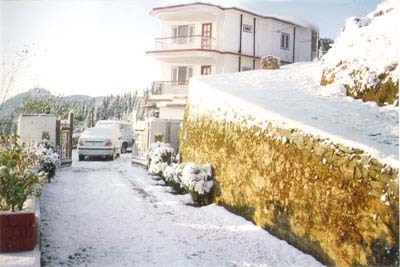 Attached balconies offers you a beautiful view of Shimla right till summer hill. Well cleaned washrooms are attached with all the rooms having 24 hours hot and cold water facility. Hotel Malhotra Bridge View has a multi cuisine restaurant that serves variety of delicious dishes. Room service is also available for the convenience of guests. The hotel also offers bar facility where snacks and drinks are offered. Sunrise Travels Shimla team visited hotel Malhotra Bridge View personally and found that all rooms are well maintained that gives a comfortable stay. The hotel is best in cleanliness. Well trained staff and good hospitality worth the value you pay for. Actual photographs taken by our Travel team are displayed above on the right side of the page.